Football is a result oriented business. Whatever succeeds, earns fame for itself and for its conceiver. And if it captures the imagination of spectators and experts alike, they do it the kindness of rewarding it with an imaginative name and legend. ‘The Christmas Tree’, erstwhile fixture in festive households suddenly became a football formation in this manner. The credit for the nomenclature probably goes to a certain Colin Welland who had the inspiration writing for ‘The Observer’ in March ’94. Unlike most renowned football tactics and formations though, the ‘Christmas Tree Formation’ rarely enjoyed the ultimate successes of football and even that came late in its relatively short lifespan under Carlo Ancelotti’s reign at A.C. Milan. Regardless of the association of King Carlo and, more intriguingly, Terry Venables with the formation, it has been used sparingly over the years in world football. In one of the first occasions Bert Head, Crystal Palace’s manager during the 70s and the first man to take them into a First Division campaign was recorded as the first man to stick a lone man upfront with two advanced midfielders in support. This pragmatism was rare back then, even for a bottom-of-the-table struggler. However, it weakens the argument of calling it a tactical intervention in that particular usage. It was used more daringly in a fluid Den Haag team of the 80s before finding fame and indeed, its name for Terry Venables’ England. Before everything else though, let’s look at what the ‘Christmas Tree’ is. It’s basically the term assigned to the basic 4-3-2-1 formation. Considered to be a defensive tactic, the ‘Christmas Tree’ was unusual as it necessitated the introduction of some hitherto unseen concepts in football. As a structure, the emphasis was on solidity and rigidity. A flat-back four preceded the ‘keeper and played behind a three-man holding midfield. The role of the central man in this midfield was absolutely vital in this strategy. This man dictated the pace of the ball and almost invariably saw the most of the ball. The other two players in this line usually had the responsibility of heading the transition of the team. When defending, one of these players would usually rush out to the oncoming attack. Needless to say, this man needed to be a good tackler as his main role was ball-winning. Gennaro ‘El Ringhio’ Gattuso immortalised this role as a part of the A.C. Milan team of the noughties. The spare third man needed to take a shielding position in this scenario to cut out any passes. 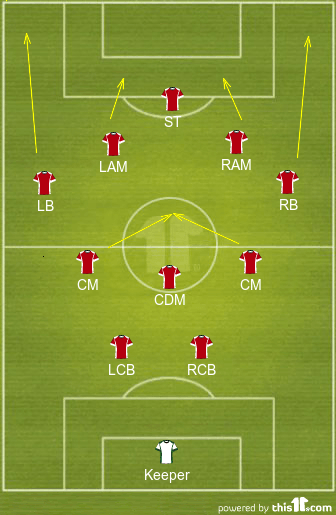 A role of great tactical importance, it was handed out to a player capable of man-marking who would sometimes be needed to double-up if one player in the backline is overrun. The front three were fairly relieved of any responsibilities in defence which was what made it a deadly strategy on the counter. The attack began with the holding player in the middle, essentially a ‘soccer quarterback’. This deep lying playmaker had the responsibility of spreading the ball to the attacking players and naturally required a great passing range. Part of the reason that the formation never succeeded for England was that they lacked a player at this position. While the British media never ceases to herald its seemingly inexhaustible supply of box-to-box midfielders, they badly lacked a long passer. Platt, Ince, McMahon were all tried and all failed. On the other end is the ageless Andrea Pirlo, the lynchpin of Ancelotti’s team. The front three in the ‘Christmas Tree’ consist of two attacking midfielders usually along with the lone man upfront. Sometimes, strikers have been played in a slightly withdrawn role alongside an attacking midfielder though. Both of these players required brilliant touch, explosive pace and good finishing. The lone striker, though, possibly had the toughest job in football. Required to chase after launched long-balls and link up with the following midfielders, this forward had to be strong, a lethal finisher and brilliant on the turn. The challenge of this role can be established in the fact that the great Alan Shearer played this role for Venables without once scoring for more than a year. The ‘Christmas Tree’ also lacked natural width, a big defect. It sometimes worked better with rampaging full-backs along the wings but that compromised the stability that it was favoured for in the first place. 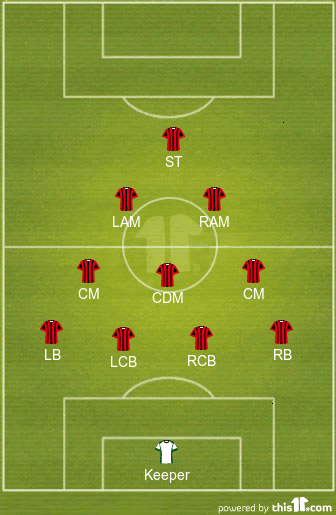 Ancelotti’s Rossoneri had Kaka as one of its attacking midfielders and Seedorf in its star-studded line-up. Shevchenko played upfront but on occasions, even Hernan Crespo was played with Shevchenko withdrawn partially. In the England team, Gascoigne did the creative role alongside McManaman. The reason that the set-up failed with England was that it was really bottom-heavy. 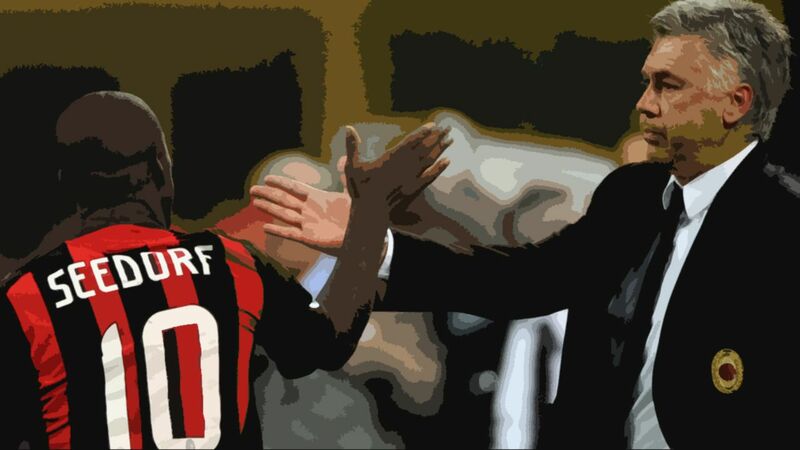 At the same time, Milan exploited the relative absence of wing-play in the Serie A. Also in Kaka and Shevchenko, they had two forwards blessed with speed and control. As the Gattussos and Maldinis aged and Kaka moved to Real, the ‘Christmas Tree’ was never used by them again. The system does have a shining legacy though. The playmaker’s role was a crucial element of even the all-conquering Spain team in the form of Xabi Alonso. The lone man upfront is the norm these days having been introduced by this formation. And no one can forget the tough-tackling, all-action midfielder’s role that the Vidals of this world play now, albeit with much more culture arguably. The ‘Christmas Tree’ might have reached its winter, but it graced many a stage for years. How badly have ac milan falled nowadays, unbelievable team they had at that time.